Oh can I do that in Workflow? So to clear that initial question or statement “Yes it is the same code build or same software” but and there is always a but, till now or until R8 is released you have not been able to run what are “Sandboxed” custom workflow plugins within CRM online. With the Microsoft Dynamics CRM Q2 service update, developers can build custom .NET Workflow activity assemblies for Microsoft Dynamics CRM Online. These custom assemblies can be developed and deployed as part of a Microsoft Dynamics CRM solution package. Once a custom workflow activity has been deployed, it can then be utilized within the workflow engine for business process management. These new capabilities ensure parity in the developer experience between Microsoft Dynamics CRM Online and on-premises. It also empowers organizations to bring external data, custom actions and integrations into their standard CRM business processes." This means you will be able to run custom workflow plugins as part of a solution. 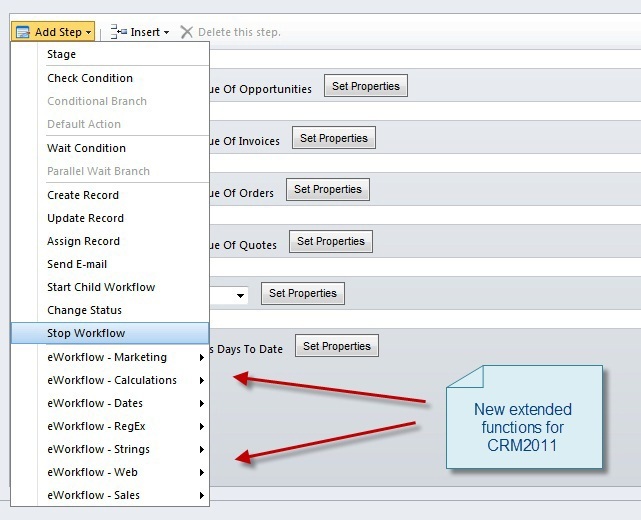 This really does bring in line the capability and functionality of CRM 2011 regardless of deployment type. So why the blog post, well as expected we are now seeing customers come to us with requests for custom workflow plugins and to be honest we could build this on a one by one basis or a bespoke basis, but we have opted to release our full library of workflow extensions for CRM 2011. So as you can see from the list above we have introduced a number of additional functions that can be used in CRM2011 but more importantly these are tested and supported to use straight from install. We anticipate that on release there may be other functions that get added, but this includes the first release. The eWorkflow Helper Library will ship with a number of tested workflow functions for #CRM2011 for both on-premise or hosted either online or partner hosted and can add a new level of automation to the implementation of CRM.